Day 203: Spring Is In The Air . . .
Spring breaks are over, and the REAL Spring time has begun. Spring officially arrived earlier this week, but with this being the first official weekend of Spring and with Daylight Saving Time in full swing, we had to acknowledge that ‘Spring Is In The Air’! Spring in these parts means cloudy mornings and sunny afternoons. Throw in some drizzle and fog and you’ve got a true Texas spring morning. Rain – the stuff that falls from the sky – is once again at a premium in our part of the world. While the Midwest and Northeast have been covered in snow and rain, the southwest has gone virtually untouched by significant rainfall. Normally, December, January and to a lesser extent , February are wet months in our part of the world; however, for the third time in five years, we’ve seen WAY below average rainfall in our normally rainy period. Not a good sign for Spring. Another harbinger of Spring in Texas are the wildflowers. Texas has been blessed with some of the most magnificent wildflowers . . . bluebonnets, mexican hats, wine cups, black-eyed susans, and many more dot the landscapes of the roads in our state. The lack of rainfall affects the quantity and length of beauty of the wildflowers. It’s a reality that is being played out too many times over the past decade . . .too little rainfall equates to too few wildflowers. Texas is one of the few states that rejoices in its wildflowers on the side of the road . . . especially our State Flower, the Bluebonnet. It’s a majestic flower but it relies on a colder than normal winter and lots of cold, wet rainfall to help it become prolific in the Spring. Other than a year ago, it has been a challenge for our State Flower to continually show up and represent our great State because of the lack of moisture. It’s kind of appropriate that tonight we open a wine from Walla Walla, Washington . 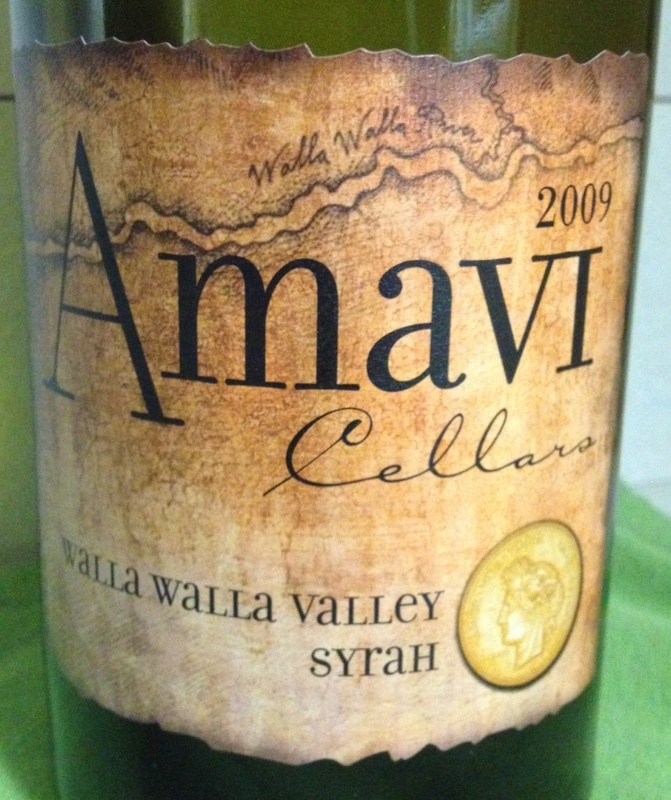 . . a 2009 Amavi Syrah, and we have to tell you that this wine will win you over–quickly! This is a BIG wine . . . the taste is pure jam and lots of dark fruit (one of the fun things about enjoying good wine is recognizing the difference between the taste of light and dark fruit . . . yes, there is a difference!) — a hint of cigar . . . kind of like a quick puff on a nice cuban cigar, tobacco and cedar — along with the prevailing oak . . . in our minds you can never have enough toasted oak because wine was fermented in French and American oak, the quality of the barrels makes all the difference. Wines like this aren’t always easy to find; like a superb Spring night, it’s availability is short-lived but fruitful! With a retail price point at $21-$24 a bottle, we were fortunate to get this wine on sale at less than $15 a bottle. While others watch, Amavi grows and becomes more bold. This wine is consistently rated between 88-90 points from Robert Parker’s The Wine Advocate. Wines as big and bold as they Syrah normally aren’t coming from Washington, do it creates a whole new market for these ‘cool weather’ wines. When we make our trek to Walla Walla – this vineyard is one we will make a point to seek out – oh, and hang out with S/S who now live in the area. We hope that you’ll enjoy this or any other wine responsibly and recycle whenever possible! Categories: Uncategorized | Tags: Amavi Syrah, Bluebonnets, Spring, Syrah, Texas State Flower, Walla Walla Washington | Permalink.